The winner is Jenny L! Congrats! I am giving away 1 bottle of Slide Ridge Honey Wine Vinegar! This stuff is just amazing. Drizzle it on sandwiches, salads, even ice cream! The smooth sugary taste of honey combined with the bite of vinegar is ingenious. Can I just say "Yum!" The salad was full of sweet vs. tangy, and the dressing fit perfectly. 1 entry: Leave a comment saying what you would like to try the vinegar on. If you need ideas, Slide Ridge has lots of recipes! The winner will be announced on Friday, September 30th. I did receive a free bottle of Honey Wine Vinegar, but the opinions are my own. The giveaway is provided solely by me. Mmm...that sounds so GOOD! Yes, please count me in! I am definitely a follower of your blog! I would most likely use it on my salads. Would love to try it on ice cream. I love balsamic vinegar on it, so why not? Following Slide Ridge on FB. I'd love to try it on Caprese. I would use it to make honey glazed chicken. I Follow The Double Dipped Life's blog as nightowl. I Follow The Double Dipped Life on facebook. 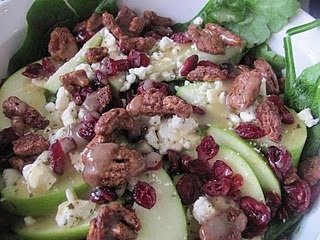 I would love to try it over a grilled chicken salad!! I am in love with Slide Ridge's Honey Wine Vinegar! I can't wait to try it on ice cream. Thank you for letting me know that Slide Ridge is on facebook. Following. And I am happily following the Double Dipped Life on facebook too! I'm intrigued with the claim that it tastes good over ice cream. I'd love to try it out! how about fresh grilled peaches , homemade vanilla ice cream then drizzled with Slide Ridge Honey Wine Vinegar----I'm hungry just thinking about it. Oooh, I'd like to try it on a salad like that! I want to try it on that amazing looking salad that you had it on!